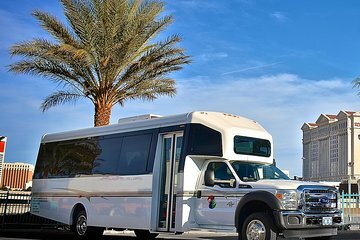 When your group arrives in Las Vegas at McCarran International Airport (LAS), enjoy a private airport to hotel transfer on a comfortable climate-controlled minibus. Your professional driver meets your group when you arrive and takes you to the minibus, where you can stretch out and store luggage in the ample interior. Make your arrival worry-free by pre-booking your private transfer for up to 27 people. Operates 24 hours per day, seven days per week to Las Vegas hotels.